Last week, I wrote about the DavidsTea advent calendar my husband bought me for December 2018. It’s filled with 24 different bags of tea. And if you follow my blog, you’ll know that tea is one of my favorite things to talk about. After covering the calendar’s first twelve teas, I worried I had droned on for too long, so I split the post in two. Here are my thoughts on the second set of teas. I will admit, I didn’t actually get through all the teas before Christmas. I got sick around the 19th and didn’t want to waste good tea while I couldn’t enjoy it. Instead, I brought the last six boxes with me when we left to visit family and used them to count down to New Years Eve. I am a recent convert to turmeric teas. The first time someone mentioned the idea, I looked at them as if they had grown a second head. But I’m glad I took their advice, because turmeric teas are delicious. Not only that, both turmeric and ginger have spectacular health benefits, especially when you aren’t feeling well. Davids Ginger Turmeric Tonic features ginger and turmeric with a genmaicha base and a hint of apple. It is, in a word, delicious. Since my husband isn’t a fan of green teas, I drank two cups of this. One with milk and one without (because I’m a fan of turmeric lattes but didn’t want to risk diluting my first cup). Both worked well, but I definitely feel like the tea works better without milk taming the ginger. I love the layered nature of this tea’s flavor; it starts with a strong blast of ginger and turmeric but ends with the nutty hint genmaicha, ensuring that every part of this tea’s composition contributes to the taste. If you’re looking for a tea that boosts immunity and tastes great at the same time, this is your winner! Another tea that made me nervous when I looked at the ingredients, mainly because there are a lot of them and not all of them seem to go together. You’ve got apple, pineapple, papaya, raisons, coconut and then you’ve also got hibiscus, beetroot, cinnamon, roasted almonds and popped rice. But I’m happy to report, this tea turned out to be a delightful surprise. The package describes it as fruity and tart. After some discussion with my husband, we settled on berry cobbler as the best descriptor – because that’s exactly what it tastes like! Berry cobbler has been one of my favorite deserts since I was young, so I’d absolutely love to drink more of this tea! If there’s a flavor combo I love more than orange and vanilla, it’s orange and chocolate. 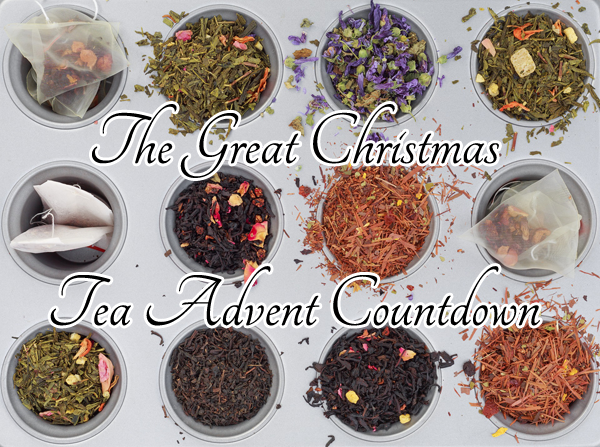 This was one of the teas I most looked forward to tasting when I read the list of teas included in the advent calendar. Its ingredients list is straightforward: chocolate and orange peel with a Pu’erh tea base. I have mixed feelings about this tea. On the one hand, it’s got chocolate and it’s got orange. The two flavors are well balanced, so neither overwhelms the other. What more could you ask for? But on the other hand, I found both the chocolate and orange flavors to be more subtle than I preferred. It could be because of how I prepared the tea, and I might fiddle around with the remaining two cups to see if I can find a way to bring the flavors a little more. When I’m drinking a chocolate fruit tea, I definitely want those flavors to pop. Another tea I was particularly excited to try. Gingerbread is something I really only get around Christmas (and if someone knows where I can score an affordable Gingerbread coffee please let me know in the comments). It’s such an iconic Christmas taste that it makes sense it would be included in an advent calendar. How do you infuse a tea with gingerbread taste? Apparently it takes a lot of ingredients, including: honeybush, cinnamon, currants, candied pineapple, crystallized ginger, maple sugar, white chocolate, ginger and safflower. All of this with a red and green rooibos tea base. I’ve mentioned a few times that Rooibos just doesn’t have the foundation for a strong, spicy tea. Often, I feel like these flavors work better with a black tea. But in this case, the gingerbread is so subtle, a black tea would drown it. Which means Rooibos is the right choice in this case. But on the flip side, both my husband and I agreed the flavor of this tea is a tad too subtle. I tried bringing out the gingerbread with milk, but that just drowned it even more. I may play with the steep time the next time I drink this. It’s not a bad tea, I just wish it had a little more of that gingerbread goodness. Of all the teas in the calendar, this is the one that surprised me most. The box describes the taste as nutty and buttery. After Forever Nuts, I expected a lot of almond shavings and almond taste. But there are actually few almonds in the mix. Other ingredients include marigold flowers and cornflower petals, with an unspecified green tea base. The first sip of this tea revealed why it’s called Sweet Almond Green. There’s not much nutty taste, and I wouldn’t describe it as buttery. But it is very sweet. In fact, both the taste and the smell struck me as candy-like. My gut wants to describe it as licorice, but it’s not as strong as pure licorice (like the flavor you’d get from Absinthe). Still, if you consider a mild licorice-like flavor, you’ll pretty much have the flavor of this tea. I loved it. My husband hates green tea so I had two cups of this and I would gladly add it to my collection. This is another herbal mishmash. The ingredients list includes: peppermint, lemongrass, hibiscus, rosehips, chamomile, valerian root and cornflowers. Ah peppermint; my old nemesis. I know from experience that valerian encourages relaxation. Many sleeping pills in England consist solely of valerian. So I decided we should drink this tea in the evening. If you’re looking for a relaxing, medicinal blend, this is your tea. I would say it’s aptly named, since it is best for the end of a long, trying day. It will certainly calm you down and get you ready to sleep. Unfortunately, if you choose your teas based on taste, this tea won’t win. I didn’t find the peppermint overwhelming, which was nice, but the tea has a definitive medicinal taste. Not quite like diluted cough medicine, but close. On the flip side, that does make it the kind of tea that’s good for soothing a sore throat and a stuffed nose. As I mentioned, I had to take a break after day eighteen’s tea, largely because I was sick and couldn’t really taste anything. So I actually drank this tea on December twenty-fourth. This is another straightforward tea. The ingredients are apple, orange peel, cinnamon, clove buds and ginger with an oolong tea base. For something that includes neither grapes nor raisons, it sure tastes a heck of a lot like wine! This tea has a smooth taste and, as a bonus, lacks the bitterness of tannin that turns me off of most wines. Both the hubs and I agreed that it could have used a little more spice, possibly from clove. I might toss a bit of The Spice Is Right into my next glass just to see how it works out. Any tea that tastes like dessert gets me excited. The ingredients for this tea include: apple, raisins, brown sugar, elderberries, willow bark, almonds, hazelnuts, sour cherries, raspberries, and stevia extract. But I wouldn’t call the taste of this tea complex. Much like the Red Velvet Cake from the first post, this pretty much just tastes like caramel. I did drink it without milk and might try adding milk next time to see if that adds a few layers by toning down the caramel. Not a bad tea, and I’ll happily drink it, but two different teas that end up tasting nearly identical makes me a little weary of trying complex cake-related teas in the future. This was the only tea in the calendar that I had already tried. In fact, Buddha’s Blend is part of my regular tea rotation. I drink this tea while I’m writing. It relaxes me and helps me focus. I’ve already raved about it, so I’ll spare you a second round. Suffice to say, if you’re looking for a staple relaxing tea, this is the one I recommend. The ingredients are white tea, green tea, jasmine pearls and white hibiscus blossoms. Bonus: it’s really fun to watch this tea unwind in your steeper! I had never heard of Tulsi before, so I looked it up shortly after trying this tea. It’s also known as holy basil and is considered sacred to the Hindu religion. The leaves are used to worship Vishnu and his avatars. So this tea not only provided a delightful taste and relaxing afternoon, it also gave me an excuse to do some research. The ingredients for this tea include: rosehip shells and seeds, apple, tulsi, hibiscus, red currants, rose petals, raspberries and strawberries. I would describe its flavor as fruity, especially with a few drops of honey to enhance it. I’m not familiar enough with tulsi to say if it stands out among the other flavors, but I do think the tea is well-balanced. It didn’t stand out as something I must own, but I certainly wouldn’t turn aside a cup. The calendar’s penultimate tea was probably one of its best. I wouldn’t have expected to be excited about Santa’s Secret since its ingredient list includes peppermint. It also features sprinkles and a hint of vanilla with a black tea base. But the peppermint here is so subtle you don’t even get the mint tang, just a nice little jolt of flavor – exactly the way I like it. The flavor is rich and bold; even the hubs liked it. Lucky for me, my mother-in-law had an extra tin she was looking to give away, so I will be enjoying this tea for a long time to come. Last, but by no means least, this tea features cocoa beans, apple sugar, chocolate chips and pink peppers. I was a little worried about the first steep since the ingredients ended up sticking in one big ball in the bag. But I have learned to trust the flavor combo of chocolate and peppers. True to prediction, this tea rocks! The flavor here is rich and creamy chocolate with just a hint of fruity sweetness (easily enhanced with honey). I loved this tea when I first sipped it, but I decided to throw in a splash of milk. My experience is that adding milk to chocolaty teas makes them taste better than hot chocolate. And guess what? This tea delivers. I might have to add this to my collection. It’ll fit nicely beside my chocolate chili chai. All in all, I enjoyed December’s tea adventures and I’m hoping to repeat the experience next year. Until then, I hope you’ve found some teas you’d like to try. Special thanks to my husband for providing me with the wonderful gift of tea experience. It was priceless!